En recension från spelningen i Sydney av ”Inside Out Webzine”/Cameron Edney. Just like the thousands of other KISS / Ace Frehley fans that attended Ace’s first ever Australian solo tour last week this show was twenty five years in the making! 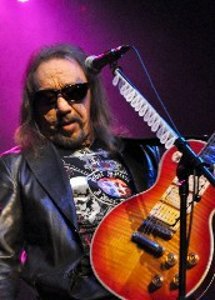 Never in a million years did I ever think I would get to witness Ace Frehley live in Australia doing a solo tour. Last year when it was first announced that Ace would be touring, no sooner than tickets went on sale, the shows were postponed. It would only be a matter of weeks before the tour would be finalised and confirmed and new dates were announced with extra shows added which delighted Kiss fans that thought they would have to travel interstate to see their hero live. Finally the wait was over, the night that Space Ace invaded Sydney was now upon us and the countdown was on! Arriving early at the infamous Enmore Theatre on Sydney’s outskirts we were greeted with massive line’s of fans that got there early to secure the best seats in the house. Just as I suspected the age of the fans attending the show were limitless! There were children as young and seven in the crowd and rockers now in their sixties all out to salute one of the most influential and greatest guitarists of all time! For me this show was extra exciting, it’s not every day that you get to photograph one of your heroes and waiting anxiously in the photo pit was something I will never be able to put into words. As the energized sold-out crowd entered, the lights dimmed and the already rowdy crowd started chanting ”Ace, Ace, Ace,” it was amazing, the energy in the room was electric. A large screen behind the band lit up showcasing Ace’s new ’Anomaly’ album cover, and the 1978 instrumental ’Fractured Mirror’ came over the P.A. System. The crowd went crazy as Ace’s amazing band took to the stage, then the moment we had all been waiting for the one and only Space Ace Frehley walked onstage signature Gibson guitar in hand and broke into ’Rocket Ride’ the roar of the crowd was deafening! 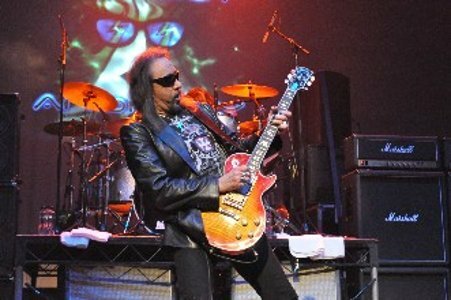 Ace Frehley may have walked onto that stage without the big extravagant costumes, without the massive lighting and stage production and without make-up but one thing is for sure… Ace put on the show fans of all ages wanted to see! It was fantastic to see a rock and roll legend walk out onstage and deliver outstanding performances one after the other without the aid of flash-bombs and lasers! This show was all about the MUSIC and the music had each and every person in the venue captivated. With a blistering set-list Ace shredded his way through KISS classics such as ’Strange Ways’, ’Love Her All I Can’ and ’Love Gun’ whilst vocal duties were handed over to both Bassist Anthony Esposito and Ex-Brides of Destruction drummer Scott Coogan and there is no doubt that both guys did an amazing job and did those tunes justice! Newest member to the Ace Frehley band guitarist Todd Youth (ex-Danzig) is fitting right in and looks at home onstage with this amazing line-up! Releasing his first solo album in years, ’Anomaly,’ it was always certain that we would be hearing some new tracks and Ace didn’t disappoint, ripping into ’Sister’ and the first single ’Outer Space’ and both tracks were amazing live and the crowd were singing along which was great to see. Playing for a solid two-hours Ace had very little interaction with the fans, instead belting out classic songs one after the other. At one point Ace did attempt to tell a joke about Jew’s in the future but seemed to lose the crowd, Ace being Ace found it hilarious and started laughing hysterically onstage which I found funny in itself! In keeping with the theme song introductions were kept short this was most notable with his 1977 classic ’Shock Me’ where Ace said ”I usually go into this big intro about how I get electrocuted but how bout we just play the song… Shock Me’ it was also one of the crowd favorites which featured Ace’s signature guitar solo that millions of guitar enthusiasts have tried to imitate since the late seventies. It was amazing to see Ace’s smoking guitar make an appearance, not only was that one of the highlights of the show, as a long-time rock concert enthusiast it’s still to this day one of the coolest things I have ever seen done live on a stage! As a lifelong fan I was so thrilled to see Ace finally playing a series of solo shows in Australia, huge thanks go out to the amazing team at Red Ant Touring who took a chance on bringing Ace Downunder for these special shows! Let’s hope we won’t have to wait so long for him to return! For me standout songs from the show included Talk to Me, Rock Soldiers, Speedin’ Back to my Baby, Sister, Hard Times and 2000 Man. 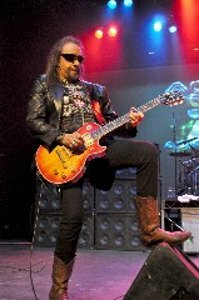 For anyone who unfortunately missed out on seeing Ace Frehley’s recent solo tour here in Australia, you missed out on seeing one of the greatest rock concerts that has passed through in recent years! If Ace does make his way back to Australia I urge you all to make sure you get out, grab tickets and enjoy the Rocket Ride! People keep saying that ACE is back! Let me tell ya… Ace never went away and the performance he put on at the Enmore Theatre certainly proves that!